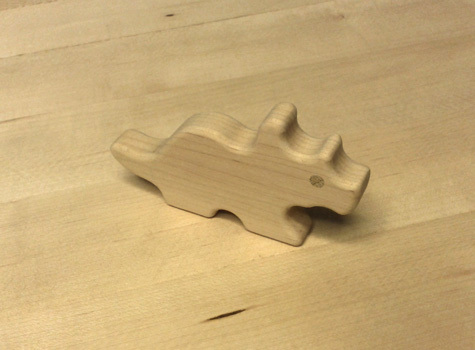 Our Classic Triceratops-Torosaurus Wooden Block Play Toy & Teether. Our Wooden Block Dinosaur Animals are double-use: suitable as infant teethers and for toddler, preschool, and kindergarten block play. Safe for ages 4 months and up. Completely free of paints, finishes, borates, pesticides, and fungicides commonly added to competitor wooden toy products. 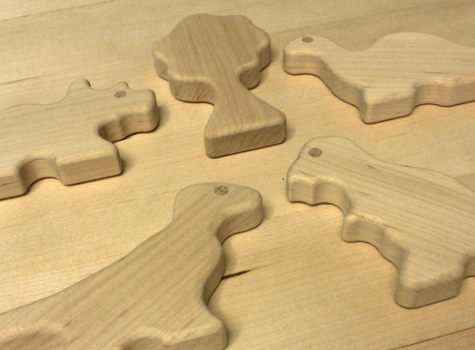 Our wooden block play dinosaurs are made of durable, smoothly sanded, uncoated Hard Rock Maple, the wood of choice for infant teethers and classroom-quality wooden blocks. Hard Maple (Hard Rock Maple) is the same species of maple that produces maple syrup. It's naturally insect and mold resistant and perfectly safe for little hands and little mouths. Both the body is made in the USA (by us) from Hard Rock Maple. The eyes are glued in place with Titebond II® wood glue which is FDA approved for indirect food contact (i.e., cutting boards). Each dinosaur is 11/16 of an inch thick, just like our standard unit block wooden planks, and cut from a block of wood approximates 5.5 by 2.75 inches. 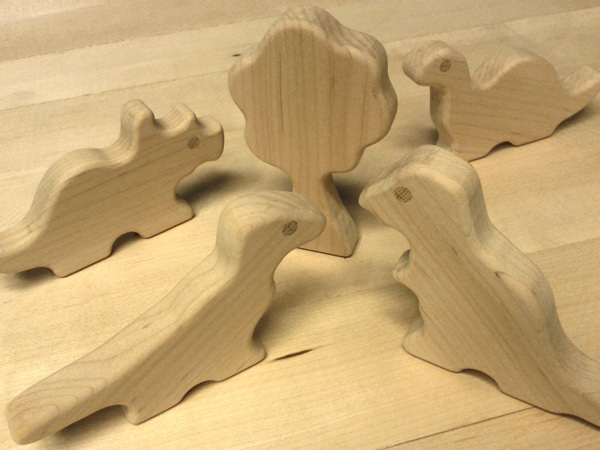 These wooden block dinosaurs are lovingly made from our own Hard Maple Standard Unit Block Half-Thickness Planks based on the original and current standard unit block sizes and shapes invented by Caroline Pratt and used in quality preschools and primary schools worldwide.